I didn’t grow up with my mommy being the one to show me how to put on blush and I didn’t grow up playing in her makeup. For the longest, I tried to figure out where my love for makeup and beauty actually came from, because it wasn’t from her. Maybe my grandmother. Or maybe I was just born with this innate love for beauty. Wherever “it” came from, I can always remember feeling a bit odd about it in my house. Not like, the Black Sheep or anything. But, I could tell that my mom didn’t really understand my obsession. And really, why should she have? I was completely, utterly obsessed with anything hair and makeup and nails from about age 5. It actually was a bit creepy now that I look back on it. Around high school, I pretty much knew that all I wanted to do when I grew up was find a way to combine beauty and media and make a living off of them. I didn’t even know what that type of career looked like. But, I never aspired for anything else. Well, maybe being on Broadway. But, beauty first. Beauty for brown girls, more specifically. My mom didn’t get it. She wanted me to be something a bit more feasible and practical. I understood this, though. Our parents worked hard for us, so that essentially we can have what they may have not. A career doing something in beauty to a woman who has been a nurse for 20 plus years probably just seemed ridiculous. But when you have a dream that is matched with your purpose and true curiosity, it’s hard to shake that feeling that if you don’t at least try to accomplish your goals, you’ll regret it forever. I wanted nothing more than for my mommy to understand this. She shielded me from going to college in NYC (the Mecca of beauty and fashion) and California (the perfect place for TV), and tried her hardest to instill “back up plans” in my head to my communications degree with talks of real estate licenses and even business management minors while studying at Temple. I thought I had proved to her how serious I was when I got my own radio show on campus, Fabulously Focused. I thought I proved even more of that seriousness when I started the Fabulously Focused blog. I had writers for God’s sake. Then, I thought it would really get to her when I almost got hired at Oxygen networks right after graduation. But at the time, I just don’t think any of that really mattered. I started to feel like this was beyond my mother wanting me to have a “real job” and a “real career”. My mother, throughout all of her surface support, really just didn’t get me. I don’t think she understood why moving to NYC five years ago to intern with Bobbie Thomas (for free) was the biggest moment of my life. I don’t think she understood my actual job and duties as EBONY.com’s Beauty and Style editor. I don’t think that she understood why I’m so emotionally attached to Beautifully Brown. That this was never just about Melanie wanting to play in makeup with her friends and look pretty. But, that beauty was truly a platform for me to connect with women and help them (and myself feel confident). Beauty was my therapy. Beauty is a way for all women to bond. My high school “girly nights”, when I did my nails, watched the CW and did a facial was my moment for me. In college, I’d share those “nights”, every Thursday, with my bestie Julianka and Grey’s Anatomy. I’m not sure she understood that wearing hot pink lipstick wasn’t just for fun, but a way for me to say, “Dark girls can rock whatever they want”. Beauty is something real for me and none of it made sense to her. And while I’ve always been that kind of person who never really cared if people got me, there’s something to be felt when you feel like your parents don’t. But, I think that changed three weeks ago. My mother and I lost my father a few years ago. And you can guess from above that we probably had never been that close. We weren’t. At any rate, when he died, there was a hole in our relationship, at least for me. We didn’t speak much. Maybe a text here and there. And we when talked on the phone, it felt forced for me. For a while, I don’t think my mother and I got each other. I really don’t think either of us tried, to be honest. I know, that’s deeper than her just not understanding my career and passion. But, I promise I’m making a connection here. Over the years, I kind of stopped trying to invite her into my world of beauty; a world extremely important to me that I shared with everyone in my life (even my first love…I gave him a facial once! ), but her. For me, giving up trying was a big deal. Because it basically started to feel like I was giving up on having a real relationship in which two people share their interests, ups and downs and daily excitements. Beauty was apart of that for me. But, I’ll admit that I always daydreamed about what it would be like to go into a MAC store and try on lipstick with my mommy. Like how the girls coming into Nordstrom with their moms would do when I worked there during college. I’d get so jealous that they’d be like a cute girl’s girl mother and daughter duo encouraging and helping each other feel pretty. Just doing fun stuff together in the name of some expensive, yet fabulous lipstick. It’s something I always secretly wanted to experience with her, but I just thought she never really cared about makeup and stuff like that. 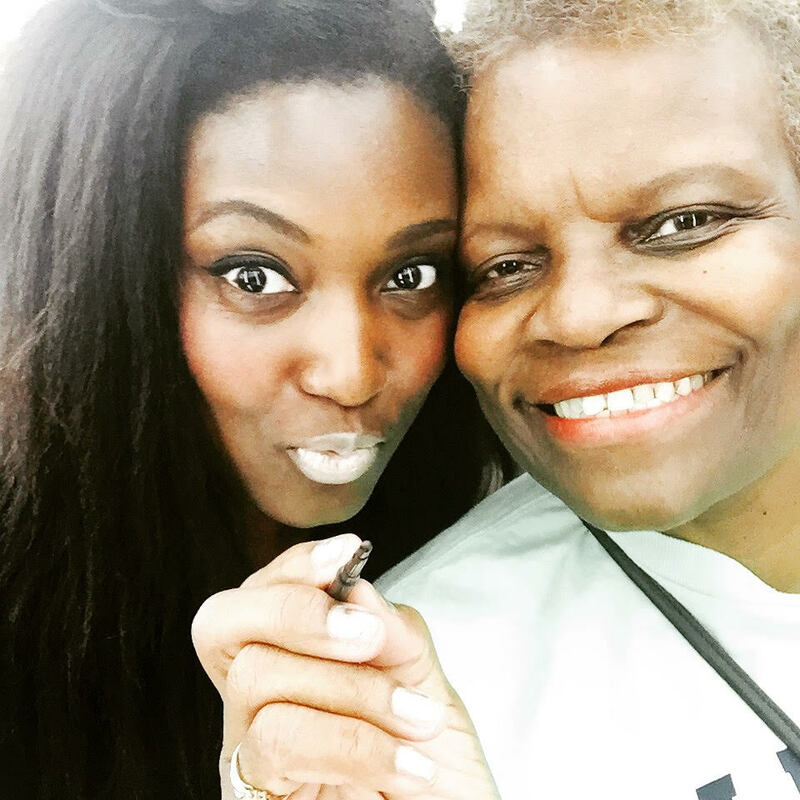 Over the last few months, I had picked up on the feeling that my mom and I missed and needed each other. Losing my daddy was hard on us both and the one thing that she and I have in common is that we grieve and deal with our issues silently. But, it wasn’t doing us any good. When she came to visit me last month, I made a vow to try and just try and see if she’d be open to some girly stuff to uplift our spirits, and just have some fun. The Friday she came to visit was cute and quiet. Dinner and bedtime. A bit of convo, but nothing major. She was tired from the bus ride. Saturday during the day felt a little better. We went to the Little Italy festival, ate Philly Cheesesteaks (don’t ask why), and started to let our guards down and grow comfortable around each other. But, it’d be Saturday night, after our movie date that would change our relationship forever. The new MAC store in Union Square is gorgeous. They all are. But, my mommy (to my knowledge) has never been in a MAC store. MAC, as we know, is the Holy Grail for makeup and makeup presentation. I really wanted my mom to just go inside and check it out. So, I dragged her in there under the promise that we’d find her a brow pencil (cuz she has no brows…poor thing). The moment we stepped in, I got weirdly emotional. The memory that will forever be etched in my mind is her face when I said “Let’s just try on a few lipsticks!”, and she said, with a warm smile, “Ok boobie doo”. I was shocked. I’d tried to do this with her before, and she always declined. We literally stood in that mirror for 25 minutes, playing around like little girls. I’d wipe off a color that I didn’t like for her and she’d turn her nose up at a bright orange I wanted to buy. It was just like the mother-daughter duos I’d watched while working at Nordstrom. There was even a moment where I looked at us both in the mirror, and literally fought back tears. She didn’t see me. She was trying on this gorgeous gold lipstick that she ended up buying. While that moment for some women may be normal, this was, for me, the first moment I felt like my mother got me. That we got each other. The first moment, in my 28 years of living, that we finally bonded. And I’ll never forget it. We ended our MAC visit with her getting her face beat. I don’t think my mother has ever gotten her makeup professionally done. Maybe for her wedding. It was such a joy to just watch her sit there, be pampered and feel beautiful. I could tell she hadn’t felt beautiful in years, especially after my dad’s passing. After we bought the makeup, we walked out arm in arm. Another thing we’d never done. It felt like my mom was becoming my best friend. From there, we went to Forever21, where I forced her to buy a gorgeous top. My mom has been struggling with her weight for a while, so I could tell she wasn’t super happy about shopping. No one is when they don’t really like their body. I know that feeling. But I just really wanted her to feel good. To feel beautiful and to feel pretty, if just for a few moments. It was seriously one of the best days of my life. It’s interesting because as I write all of this, I’m starting to think that maybe, throughout all of this time, I didn’t really care much for my mother to approve and understand my love for beauty. Maybe, I just wanted her to see her own. I really hope she did. I just got a new best friend (who will forever copy and paste the same text message to me until I respond). What a beautiful essay. Thank you for posting it.